(2 Customer Reviews) | Write Review 6 issues per year Where cottage/cabin owners go for fun, practical advice, and inspiration. You’ll get real estate trends and lots of maintenance tips in our Advice issue, and building projects and design ideas in our DIY issue. Plus loads of entertaining ideas in our Summer Entertaining issue. Cottage Life is your go-to source for getting the most out of your recreational property, whether an off-grid cabin or a comfy home away from home. Why not have all of our great award-winning content at your fingertips to enjoy wherever you are. Cabin fever! As we dive headlong into spring, our May issue will get you ready for the new season. Pick up the May 2019 issue today! Where cottage/cabin owners go for fun, practical advice, and inspiration. You’ll get real estate trends and lots of maintenance tips in our Advice issue, and building projects and design ideas in our DIY issue. Plus loads of entertaining ideas in our Summer Entertaining issue. Cottage Life is your go-to source for getting the most out of your recreational property, whether an off-grid cabin or a comfy home away from home. 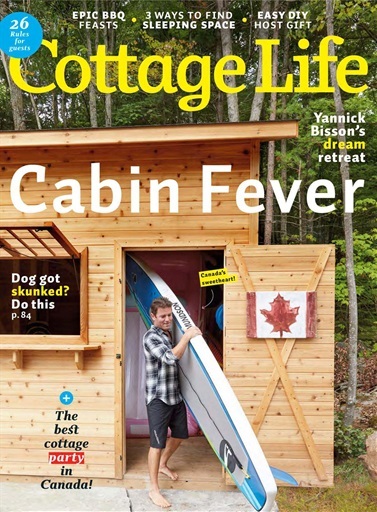 You'll receive 6 issues during a 1 year Cottage Life magazine subscription. We are always looking for new things to do on the barbecue and this issue had some great ideas. Can't wait for Cottage Life to arrive in the mailbox. Great articles (cottage opening tips are always spot on and helpful) and great pics. Always a pleasure to read on the dock. Keep it up! ?? Below is a selection of articles in Cottage Life May-19. 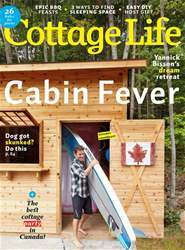 You'll receive 6 issues during a 1 year Cottage Life magazine print subscription.